Grades 3-6. First Second, March 2016. 128 pages. Review copy provided by my local library. So, this is one entry in this cool new series called Science Comics, which is just what it sounds like: comics about science. This book is all about coral reefs and I guarantee that you will learn something you didn't know before, even if you are a super ocean expert. Did you know that scientists have developed cancer-fighting drugs from coral reefs? Did you know that coral reefs are home to a quarter of the animals in the entire ocean? Do you know what a cnidarian (NIE-darian) is?! 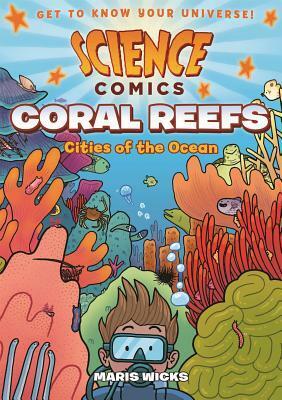 You'll learn all that and much more in this comic book all about coral reefs. What I love about this book is that it's told in a cute, funny style that will have you laughing even as you're learning. If you like science and comics, this is definitely the series for you! A fun and informational introduction to coral reefs, this book contains TONS of science info. Maris Wicks does a great job of starting from the beginning with each subject, whether it's the difference between animals & plants when introducing the reader to coral or what climate change is when talking about how the environment affects coral reefs. Even kids who think they know a lot about coral reefs and the ocean will probably learn something new from this book.... and they will enjoy doing it! Wicks's cute, cartoony style is a great medium for the information. She puts in lots of funny little asides and cute, humorous illustrations. One of my favorites is an illustration of flowers "eatin' up the SEE-OH-TOO"/"fartin' out the oxygen". The book is filled with funny little things like that that will keep readers laughing and poring over the illustrations for more. Readers who enjoy their nonfiction in interesting packaging might also like the Basher Science series or Nathan Hale's Hazardous Tales by Nathan Hale. Readers who enjoy Maris Wick's funny style would do good to pick up her Human Body Theater.